Hi everyone, quick update on my whereabouts: this Wednesday (tomorrow) I’ll be going to work in Lima, Peru for six days. I’ll be working with a savings and credit program with a local church called “Iglesia Alianza Cristiana y Misionera de Comas.” (www.acymcomas.org) I’m sorry for how late this newsletter is coming through; I was at the HOPE International Leadership summit in late May, and since coming back I’ve had a whirlwind tour of the interior of the island for work. Do pray for our trip with HOPE in Lima, Peru, and look for my June newsletter about Peru at the end of this month! 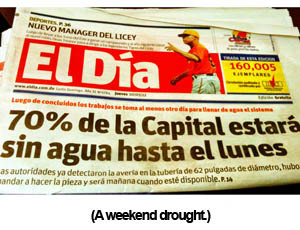 Humidity was at about 70% when the newspapers said that at least 70% of the capital would be without water for the next four days. Ironic right? All that water just lingering up in the air and not running through the capital’s pipes. That’s about 2.1 Million residents without access to running water. Even though the temperature read 90°F which “felt like” 97°F, ask any local, and they’ll tell you what it really felt like. (Cover your ears.) It felt so sticky, so sweaty, so stinky, so dirty and you couldn’t even wash your hands. We lost water on Saturday in my apartment, and when no water came from the bathroom sink, I thought to myself “Oh, I’ll just try the kitchen.” That’s the thing about an infrastructure problem – it’s everywhere. It’s inescapable, and you can’t just turn it back on when you want to. Someone else decides that, and when there’s no water and you’re incredibly thirsty, well, that’s a hard thing to swallow. I found it coincidental that for my assignment following the weekend of drought I was to visit two Esperanza water projects that are capable of producing 3,000 gallons of clean water a day for the communities in which they live. When I arrived, they had water, plenty of water, and people came in droves when the city could finally turn the water back on. Esperanza’s main ministry to the people of the Dominican Republic and Haiti are through the micro-loans in their community banking lending program. They also do larger loans to schools and loans for building and maintaining commercial grade water systems that we call “water loans.” These water loans go to churches who build a small storefront at their church location to sell the water to the community at a much more affordable price than the local corner convenience stores. What I also love is that from an organizational standpoint we make loans and provide business training to these small churches to help them make the right financial decisions for their enterprise and for the community. Since partnering together is such a large part of our philosophy, we deliberately choose the kinds of clients we work with who share our same mission and vision for impacting the local community and improving the state of health and well being of the local area. 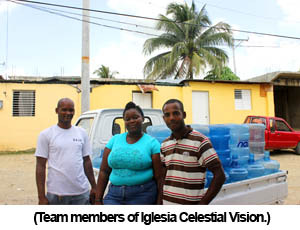 My first water stop was at the Iglesia Celestial Vision (pictures above), and I learned a great deal from the associates who’ve been selling clean water for a year and a half. Right now, they are in plans to upgrade the equipment to produce more on a daily basis, from 3,000 gallons a day to 5,000. For them though, water is also a way to get people to church. 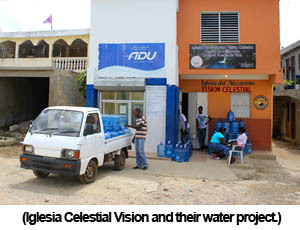 Many new members of the congregation have come from the community nearby simply because of the water project outside the church. 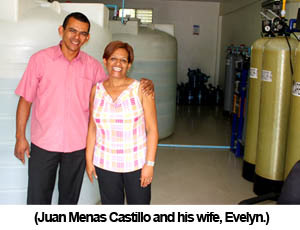 I moved onto a second water project to speak with Juan Menas Castillo and his wife, Evelyn, about their water businesses. 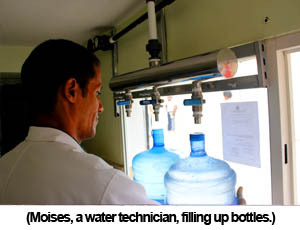 They’ve been operating now for about four years after Juan, a water technician and engineer, decided to start his own business with his wife. 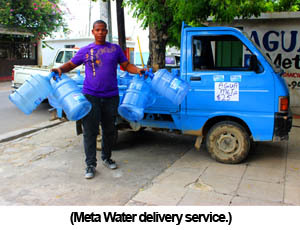 Through the counsel of their pastor and other members of their church they started off with a small system and one delivery truck and called it “Meta Agua” (could be translated to “Goal Water” or “Water with a Purpose”). Now, they have three small delivery trucks pictured below and one delivery motorcycle that can hold three five-gallon bottles of water. When I asked Juan about his motivation for starting his business, Meta Water, he simply replied that “Water is basic to our lives. Everyone needs to have clean water. Everyone deserves to have clean water. What I do isn’t that special, God gives us water to live, and we make it available to the community.” I responded by saying that the work he is doing is good, it’s a way of providing a tangible form of the blessings we all receive from God. He’s humble, and he didn’t respond in kind, but said that he is happy that he is able to employ five more people from the community. “Wow! What an amazing man.” I thought. I think water project is a beautiful thing in itself. It’s a way to serve hundreds of families of a community by providing something they really need. Water is something so basic, so miniscule, and yet we overlook it frequently. That is of course until 70% of the capital doesn’t have it, and then you can’t even wash your hands. He imparted a vision for what we can do with Christian micro-financing in an economically poor communities. A vision for doing what we do well, integrating ourselves in a community, and most importantly, like Juan mentioned, in believing for ourselves what we aim to tell others. In this way, people will know who we are and why we do what we do. Go fill up a tall glass of water from your kitchen sink as you think about the leaders who operate one of Esperanza’s 17 commercial grade water projects that serve over 30,000 families in the Dominican Republic. In the meantime I will pray that you would be filled with that water that satisfies your deepest thirst. This entry was posted in Dominican Republic, Monthly Newsletter on June 19, 2012 by Aaron. I often remember a quote from one of my favorite teachers in high school, Ina Baker, when I’m stuck between making a buying decision. She always said, “You vote with your dollar.” We have the ability to help promote the longevity of a business or brand by purchasing more of a product, and conversely, contributing to its demise by not buying. People beg for money on the streets here quite frequently. My usual rule is that since I don’t know where the money goes, I don’t give out money, or I try to give food instead if indeed that’s what they’re asking. I make exceptions when the person seems out of place, i.e. someone who seems unaccustomed to begging (maybe meaning they really do need the money), and I realize it’s a completely different story when someone is selling something on the street. This person is not begging, no, they are trying to make an honest living by spending their time working. Instead of asking for money, they are doing business. I love to support people who work hard. Often, when I’m in the communities I’ll buy food or drinks or something else from an associate of Esperanza because I believe it helps to promote what Esperanza and HOPE International believe: a sustainable way out of poverty comes from improving a person’s economic condition. Walking to the supermarket this past Saturday evening, a voice next to the shopping carts called out to me “Quiere bolas de maiz, a 5 pesos?” (Do you want corn balls, 5 pesos each? – about US $0.15 each) I had my agenda, my shopping list ready, so I paid little attention to the young man, and walked into the air conditioned store. 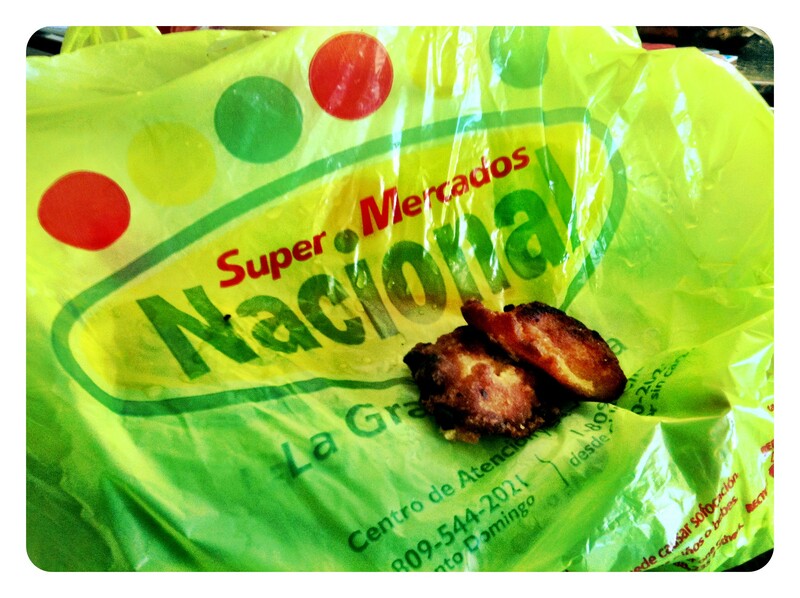 I had just spent $1,600 pesos (about US $40) for some food for the week and had about nine grocery bags in my hands. I heard a voice from the shopping carts again. Something about the meekness in his tone struck me and made me stop to pause my route back home. A young man walked out from the shadows and I could see in his hands a medium-sized tin bowl covered in saran wrap were a pile of fried corn balls. I felt compelled to buy from him. I wanted to continue what he was doing. Honest work, hard work, at night, in a place that was lonely and challenging. Shoppers were spending thousands of pesos on food, and he was asking just 5 pesos for his home-made goods that most likely his mother made and asked him to sell. So with nine grocery bags in hand, I reached in to get my wallet. He offered to help me hold the bags. I saw a $25 peso coin and two $5 peso coins. I really didn’t want five of the fried corn balls, and I didn’t want to overpay him (because that’d be too obvious), so I got the two $5 pesos out and asked him for two. He gladly took the money and wrapped the fried corn balls in napkins and gently placed them in one of my bags. I felt satisfied, but guilty for not buying $25 pesos worth from him, and continued my way back home, wondering how long he was going to stand there selling his home-cooked fried corn balls in front of the massive shopping center in the night by himself. I know that next time, I’m going to vote for him with my pesos. This entry was posted in Dominican Republic on June 3, 2012 by Aaron.